In the fifth in our series on understanding Asia-Pacific sea power, we look at the PLA’s growing expeditionary capabilities and its greater implications. This is the fifth entry in our series on understanding Asia-Pacific sea power. China’s military is in the nascent stages of becoming an expeditionary force. 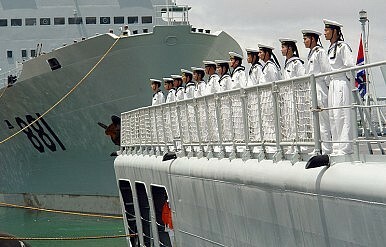 The country’s anti-piracy deployment to the Gulf of Aden and the use of naval and air assets to support the evacuation of Chinese citizens from Libya in February and March 2011 have shown real capability in this arena. What is an expeditionary power? The US Department of Defense defines it as ‘an armed force organized to accomplish a specific objective in a foreign country.’ Additionally, such a force should be able to transport, sustain,and protect itself so that it hasthe freedom toconduct independent missions necessary forthe defense of national interests. The PLA’s gradual but important evolution toward greater expeditionary capability coincides with China’s steadily rising economic presence and the increasing number of Chinese seeking their fortunes in volatile but often fast-growing countries in places like Africa, Central Asia and the Middle East, both as employees of large state conglomerates and as private entrepreneurs. For now however, due to cost and perception reasons, China’s expeditionary capabilities will most likely be tailored to handling threats to Chinese citizens and economic interests abroad. Foremost among these are non-traditional threats to resource security, such as piracy and terrorism, as well as threats to PRC citizens overseas, such as the internal chaos seen in Libya. Compare this with the US military, which possesses highly sustainable expeditionary capabilities that enable it to fight large wars halfway across the world and simultaneously handle other contingencies. The platforms and operational infrastructure that make high-intensity missions possible can also be scaled down to deal with non-traditional security missions like humanitarian relief after the 2004 Indian Ocean Tsunami or suppression of piracy off Somalia. Therefore, the PLA’s naval, air and ground capabilities for out-of-area operations are likely at least 15 years away—and even further away from achieving the ability to handle the range of missions—from achieving the capabilities the US Department of Defense possesses today.